The right form and serving. 1 teaspoon of our patent-protected Dry Eye Omega Benefits formula provides the recommended serving (2-3 grams) of omega-3s in the re-esterified triglyceride form (rTG). Easily digested. 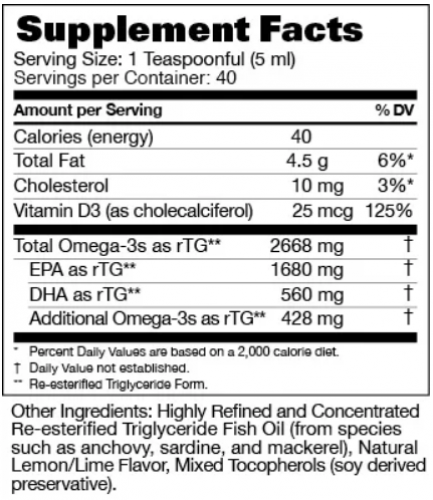 This product has no gelatin or capsule so it provides direct easy digestion and absorption of the omega-3s. Great taste. Dry Eye Omega Benefits has a great-tasting lemon/lime flavor. Third party tested for purity and safety. PRN products are manufactured in Norway in pharmaceutically certified facilities. Every batch is tested for over 400 contaminants by an outside third-party to ensure quality and purity standards. Our proprietary molecular distillation process guarantees the removal of significantly more PCBs (known carcinogens) than non- distilled omega-3 products commonly found over the counter.